Drama is the tenth studio album by British progressive rock group Yes. It is unique for being the first Yes album release without vocalist Jon Anderson. In early 1980, after rehearsing music for the follow-up to the tepidly-received Tormato, both Anderson and Rick Wakeman departed the band over creative and financial differences. Reportedly Anderson and Wakeman were the most enthusiastic about creating a new album, and the rest of the band was lukewarm over the idea, given the relative failure of the last album. This in turn discouraged both Anderson and Wakeman, with the latter at times refusing to leave his room, and both men dejectedly spending time at a local bar. They quit the band soon afterwards. Undeterred, the remaining members, Chris Squire, Steve Howe and Alan White, carried on. Trevor Horn and Geoff Downes of The Buggles (who had recently had a number one hit in the UK with "Video Killed the Radio Star", and were managed by Yes' long-time manager Brian Lane) were working in an adjacent studio, and, being Yes fans, introduced themselves. As it happened, Squire owned and enjoyed their first album, and the pair were invited to sit in during rehearsals. They were soon asked to join the band. Recorded that spring and released in August, Drama featured a harder-edged Yes with a distinct new wave flavour (in no small part due to the two new recruits). Perhaps to ensure that some of the old glory was there, Roger Dean was commissioned to design his first Yes cover in five years, and Eddie Offord, who had co-produced the band in their 1971-1974 heyday, returned to the studio for assistance. 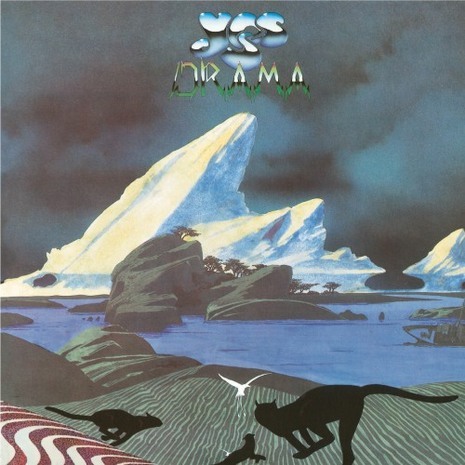 Drama fared very well in the UK charts, reaching #2 there, but American audiences were not so sure, with Drama becoming Yes's first album there in years to not reach the Top 10 or go gold. Still, the US tour was a big success. They were not so lucky on the UK leg, with some fans angry over Anderson's replacement and Horn's voice suffering from his first experience of major touring, as well as his efforts to match Anderson's higher register. Horn subsequently quit the band, and Yes officially ended in early 1981 (although another version would reform two years later with a very different sound). By then, Howe and Downes were in Asia. Trevor Horn would return not as a member of the band, but to produce their commercially successful 1983 album, 90125. After Jon rejoined, Yes did not perform any of the songs from Drama, as Jon refused to sing them (although Anderson would sing the token words "yes, yes" during the instrumental portion of "Tempus Fugit", included in Squire's "Whitefish" medley). When Yes reconvened without Anderson in 2008, they did perform "Machine Messiah" and "Tempus Fugit" with new vocalist Benoît David. It has been rumoured that Anderson was prepared to rehearse certain songs from the album in preparation for their 35th Anniversary Tour, but the rest of the band were not prepared, under the assumption that Anderson was still uninterested.